The Original Knickerbocker: Washington Irving & "The Legend of Sleepy Hollow"
Why is Washington Irving known as the Original Knickerbocker? Come on this one-hour walking tour and find out! You'll also enter the Receiving Vault, see the Revolutionary War Memorial and "meet" some of Irving's contemporaries on this tour. It's a fun way to spend an hour! Dates: Every Saturday and Sunday from 11:00 a.m. - 12 noon, plus Memorial Day Monday. Location: Sleepy Hollow Cemetery South Gate, 430 North Broadway. Skill level: This tour includes a steep hill, some stairs and grassy, unpaved gravel roads. There is no place to sit down during the tour. Please consider your own abilities before purchasing tickets. Feel free to call the office to discuss any specific concerns. Refunds, exchanges: All sales are final. No exchanges or refunds unless tour/event is canceled. 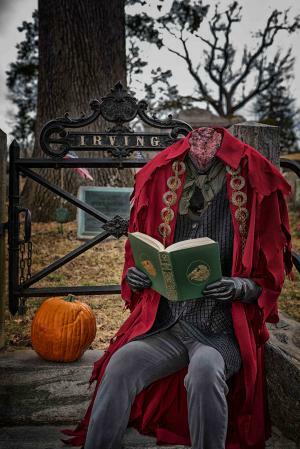 Weather: Sleepy Hollow Cemetery walking tours run rain or shine. If a tour is canceled due to severe weather such as high winds, lightning, or heavy rain, we will promptly refund the ticket purchase price, less processing fees. Cancellations will be posted at least one hour before tour time on our website and Facebook page. We will also contact you via the email and phone number provided during the purchase process.